Sleeping inside nature and getting outdoors. Embraced by the outdoors, your first step inside warms your inner child thirsting for nature. With attention paid to every detail, Big Cypress Lodge in Memphis wins big for getting in touch with your connection to nature. Memphis, Tennessee’s outdoor adventure started indoors. 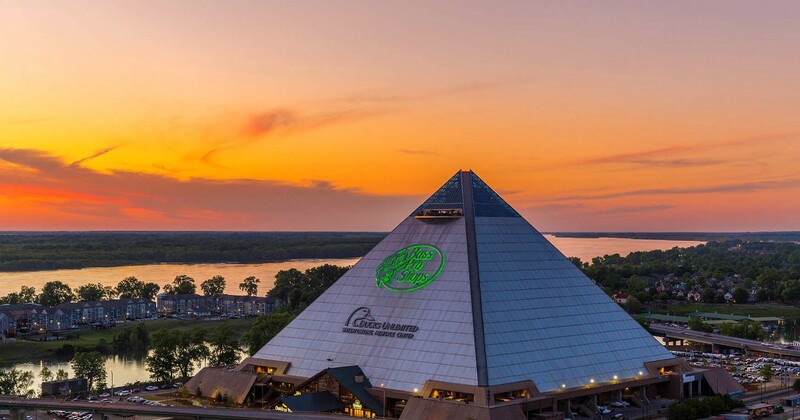 Housed inside the iconic Memphis Pyramid, now called Bass Pro Shops at the Pyramid, Big Cypress Lodge is unexpected and breathtaking. Offering room balconies overlooking the Bass Pro Shops retail and lifestyle areas on the ground floor, it is unlike anything I have ever seen with catfish as big as myself swimming among the tastefully done ponds spread among the retail space. I dream of weekend escapes to the mountains: hiking through forests of fresh pine, creating snow angels under perfect blue skies, wrapping my hands around a warm mug of hot cocoa while overlooking fields of streams and trees from my deck, and fishing for my perfect catch to brag about for years. Sitting on the wood chair in the screened in porch at the lodge, somehow revitalized my dreams of being in the wilderness. Memphis surprised. The lodge transported me to vivid flashbacks of living among the air of 11,000 feet in my mountain town of Saratoga, Wyoming. It felt right. It felt good. I wanted to go beyond the Bass Pro experience, and discover the great outdoors and local city adventures, and so I called upon a former local, Sara Strom, to give me some highlights. Shelby Farms Park — Connect to nature at this beautiful green space. Bike, kayak, walk on a trail, or observe the buffalo at this unique park. With activities for everyone, including a treetops adventure park, you won’t be disappointed with your time outdoors. Meerman-Shelby Forest — 13 miles north of Memphis, Meerman-Shelby Forest offers over 12,000 acres of bottomlands bordering the mighty Mississippi River. Feel poetic with nature as birds grace your view and fish flop from fishing poles. You may even spot some wildlife. Ghost River — Feel like floating on a river? Try a canoe trip on the ghost section of the Upper Wolf River. Its story book images will leave you mesmerized. Stand up paddle boarding is also an option. Bardog — The small, eclectic atmosphere invites with great energy and yummy food. Customer service is top notch, it is off the main drag, and the deluxe grilled cheese is a must. Rum Boogie Cafe’s Blues Hall — What a treat, and my favorite spot on the famous Beale Street! The jam session here will have you on your feet and dancing. With walls adorned with historic photos, its nostalgia can be felt and heard. Earnestine & Hazel’s — Dark and grungy works for this dive bar, but the stories of the late (haunted) brothel of the second floor will have chills in your bones. Known for the presence of legends such as Elvis and B.B. King, this spot is deep-rooted in Memphis history. If your significant other loves anything Bass Pro, Big Cypress Lodge is a perfect surprise for an experience not duplicated anywhere else. #Getoutdoors and fill your cup with nature in Memphis.